The first is a walk exercise. 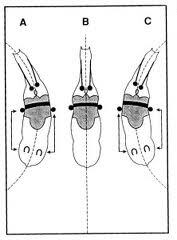 Ensure your horse is in a long and low frame and make a 10-meter circle at A, C, B and E. Really feel the inside hind stepping under your horse on the circle and be sure to keep a bend through the horses whole body. Straighten on the long sides and bend into the next circle. Do the same on both reins. The second is shoulder fore. Again, in a long and low frame, keep the horse in shoulder fore around the entire school. Along the straight, on the corner and then straighten for a lap, change the rein and do the same on the other rein. Just a couple of pointers, in exercise 2, it may take a while for your horses strength to build in order to keep the shoulder fore for a lap of the school and keep both of the exercise in walk until you feel entirely happy that you will not lose balance in the trot. Depending on your level of work, you can do the same in canter. These exercises take a few minutes and if you regularly introduce them into your working in, you see a difference in everything you do, because your horse will become and remain more supple. After each exercise, give your horse the buckle end of the rein and I guarantee he’ll stretch down and walk forward with purpose as he’ll feel loose.